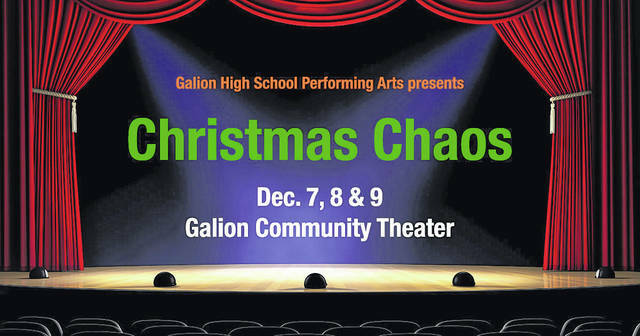 GALION — Galion High School Performing Arts will present “Christmas Chaos” next week at The Galion theater, in Historic Uptowne Galion. a’Christmas Chaos” is a comedy about a theater that hired a traveling troupe to perform the holiday class “A Christmas Carol.” But the troupe never shows. Now what. Those at the theatre do the only thing they can do. They decide to stage their own version of “A Christmas Carol”, and have only a few hours to get ready. The audience will watch a behind-the-scenes view of putting on a show, but it doesn’t take long before a few mishaps occur, and hilarity ensues. Show dates are Dec. 7 and Dec. 8 at 7 p.m., and Dec 9 at 2 p.m. Tickets are available at the door before each show and cost $8. Don’t forget this show is being performed at Galion Community Theatre in uptown Galion.